Mangroves are one of the few plants that can withstand Qatar’s harsh desert conditions. Neil Palmer (CIAT). DOHA, Qatar (8 December, 2012) – Indonesian scientist Daniel Murdiyarso and Lebanese scientist Mohamad Khawlie are spending the morning hopping over muddy streams, tasting salty leaves, and examining aerial root systems. Just 60 kilometres from Doha but a world away from the air-conditioned unreality of the Qatar National Convention Centre where the UN climate talks are taking place, Murdiyarso and Khawlie are exploring Qatar’s northeastern coastline, indulging a shared passion – for mangroves. “Mangroves have been here in the Arab Gulf since ancient times,” says Khawlie, an environmental consultant with the Qatar Environment and Energy Research Institute (QEERI). Coastal ecosystems like this one at Al Zakhira play a special role in Gulf countries like Qatar, where few other plants can withstand the harsh desert conditions. Mangroves and salt marshes are uniquely adapted to the Gulf’s saline seas, high winds, and infrequent rainfall; and they provide a haven for birds, fish and other animals. And, as Daniel Murdiyarso from the Centre for International Forestry Research points out, they’re also critically important for climate change. “Mangroves are very good at sequestering carbon – they store five to eight times more carbon than tropical or boreal forest,” he says. Mangrove forest’s complex root systems anchor the plants into underwater sediment, slowing down incoming tidal waters and allowing organic and inorganic material to settle into the sediment surface. Low oxygen conditions slow decay rates, so much of the carbon accumulates in the soil. When mangrove swamps are converted for other uses, large amount of carbon are then released to the atmosphere. “So losing mangroves, even if it is a small area, is very significant in terms of carbon loss,” says Murdiyarso. Over the last 35 years almost 50 percent of the Earth’s coastal ecosystems have disappeared due to agricultural and aquaculture expansion, forest overexploitation, infrastructure and industrial development. This doesn’t just result in carbon emissions. It also renders coastal populations more vulnerable to the effects of climate change, including sea level rises, storm surges and high winds, as losing mangroves means losing a natural barrier that protects coastlines and prevents erosion. 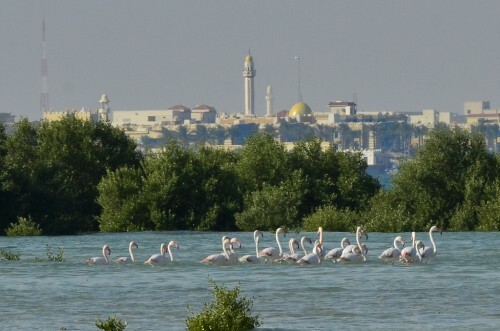 Khawlie said that Qatar has recently recognised the value of its mangroves, with 40 percent of the country’s coastline now protected by the government. “The implementation of the law is also improving,” says Khawlie. Khawlie is working with QEERI, part of the Qatar Foundation, as well as Qatar University and international partners including UNESCO and Conservation International (CI), to develop projects focused on Qatar’s mangroves, including mapping their biodiversity and exploring their cultural significance. 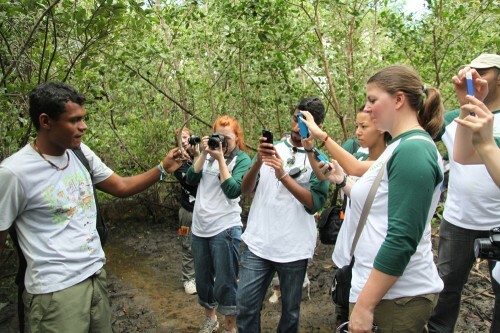 In July, the Qatar Foundation together with CI, launched “Mapping the Mangroves”, a project which encourages the public to upload GPS-tagged photos, videos, and text about Qatar’s mangroves to an online map. The crowd-sourced data can be used by scientists, educators and NGOs – and has recently been expanded worldwide. CIFOR works on mangroves through the newly-renamed SWAMP project (formerly the Tropical Wetlands Initiative for Climate Adaptation and Mitigation or TWINCAM) and is currently exploring a relationship with QEERI. As Murdiyarso and Khawlie explore the Al Zakhira wetlands, a flock of flamingos takes flight and swoops south towards a horizon dominated by new housing developments. Murdiyarso says given the importance of mangroves – and wetlands in general – for climate change, they need to be given more attention by the climate negotiators locked in discussions down the highway in Doha. “Mangrove ecosystems are undergoing high pressure worldwide,” he said. Last week, the technical advisory body to the UN Framework Convention on Climate Change (UNFCCC) agreed to hold a workshop to discuss research developments in coastal and marine ecosystems – the first step in getting mangroves on the international climate agenda. The workshop is expected to take place in Honduras in the second half of 2013.